Jupiter is almost overhead at dusk, but now a little toward the west. Face high in the west at dusk and look for the brightest thing there (unless the Moon is also there), as Jupiter outshines all stars we ever see at night. Saturn remains in the morning sky this month. Look for it in the south/southwest at dawn. Venus and Mars are on the far side of the Sun and out of sight this month. Venus passes behind the Sun (at superior conjunction) on March 28. Brilliant winter stars shift toward the southwest during March. Dazzling Orion is almost due south at dusk. His three-starred belt is halfway between reddish Betelgeuse and bluish Rigel. Orion’s belt points up to Aldebaran in Taurus the Bull. This winter and spring the Bull also contains Jupiter. To Orion’s upper left are the twin stars Castor and Pollux, marking the heads of Gemini, the Twins. You can find Sirius, the brightest star we ever see at night, by drawing a line from Orion’s belt towards the horizon. To Orion’s left, about level with Betelgeuse, is Procyon, the Little Dog Star. From Sirius, look a little bit to the right and then straight down to the horizon. If your southern horizon is clear of clouds and tall earthly obstacles, you’ll see Canopus, the second-brightest star ever visible at night. This star is so far south that most Americans never see it and many star maps made in the USA omit it. (You must be south of 37 degrees north — the latitude of the USA’s Four Corners — for Canopus to rise). As you view Canopus, keep in mind that the sky we see depends on our latitude as well as on time of year and time of night. Joining the winter stars are stars of spring rising in the east. Look for Leo, the Lion at dusk. Later in the evening, extend the Big Dipper’s handle to ‘Arc to Arcturus’ and then ‘speed on to Spica’; these stars rise at about 10 p.m. in early March but by 9 p.m. on the 31st. March 2013 evening skies feature an extra special object — comet Pan-STARRS, our first naked-eye comet since Hale-Bopp back in 1997! Observers south of the equator have already been observing Pan-STARRS, but the comet has been invisible to us because it has been south of the Sun in our sky. That is beginning to change as Pan-STARRS nears its closest approach to the Sun late on March 9. Like all comets, Pan-STARRS will be at its brightest as it comes closest to the Sun. At the same time, Pan-STARRS will be coming up through the plane where the planets orbit and thus will be much easier for us to see in mid-March. You can start looking in western twilight as early as March 7 if you have a low, unobstructed horizon. The comet may be slightly easier to see on March 12 and 13, when the crescent Moon is nearby. Once Pan-STARRS appears in the western dusk sky, it shifts towards the north (to the right as you face west) each night, until it fades and returns to the Sun’s glare in April. As always, scientists are unsure how bright Pan-STARRS will get. It now seems that it won’t be as spectacular as was Hale-Bopp in 1997. However, southern observers are seeing it naked-eye, and so should we. The comet could be about as bright as average stars such as those in the Big Dipper, but may be dim enough that you need a dark site to see it, especially once the Moon gets bigger. Ultimately, though, we’ll have to wait and see. 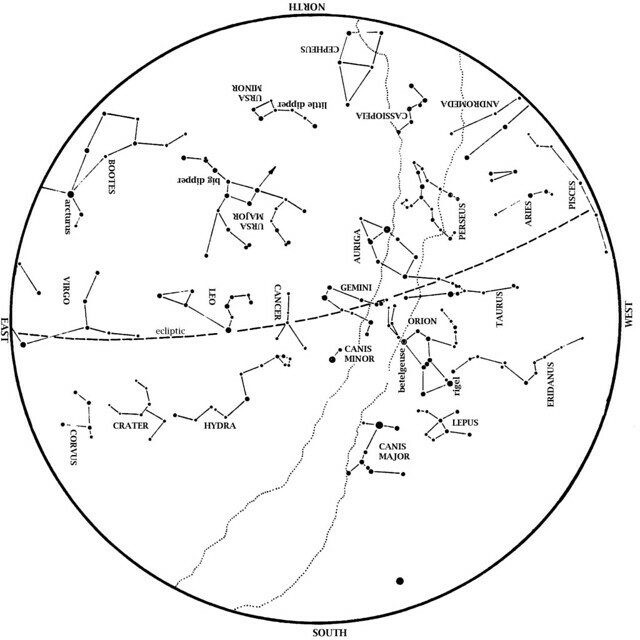 Sky and Telescope has a helpful finder chart here. At 6:01 a.m. on Wednesday, March 20, the Sun is directly overhead at the equator. This therefore is the vernal (spring) equinox, a day when everyone on Earth has the same amount of daylight. After this date, our gradually lengthening days become longer than our nights, and we go into springtime. South of the equator, days have been shortening. For them, this equinox marks the point when night becomes longer than day, and the onset of autumn. Sunday, March 10, is the second Sunday of this month. Therefore, Daylight Saving Time begins at 2 a.m. this morning (the time officially goes from 1:59 to 3 a.m.) Don’t forget to spring forward by advancing all clocks one hour on Saturday night, March 9! On most clear Saturday nights at the George Observatory, you can hear me do live star tours on the observation deck with a green laser pointer. If you’re there, listen for my announcement. This Spring Break, the George will be open to the public on Tuesday night, March 12, and Thursday night, March 14.